People with autism are being left behind today, with only 16 per cent in full-time employment. This inspiring book addresses the lack of understanding of the wonderful contributions people across the autism spectrum can make to the workplace, drawing attention to this vast untapped human resource. Employers who create supportive workplaces can enhance their companies by making use of the talents of people with autism while also helping to produce a more inclusive and tolerant society, and people with autism can themselves benefit materially and emotionally from improved employment opportunities. 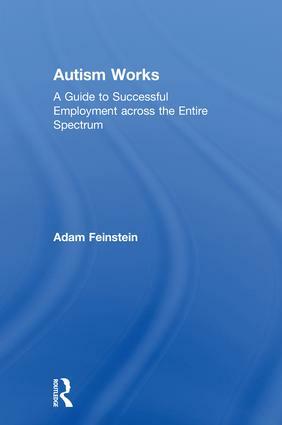 Packed with real-life case studies examining the day-to-day working lives of people across the autism spectrum in a wide variety of careers, this book provides constructive solutions for both employers seeking to improve their workplaces and for individuals with autism considering their employment options. It dispels popular myths about autism, such as that everyone is good at IT, and crucially tackles the potential job opportunities available across the spectrum, including for those who have no language at all. It also highlights the neglected area of gender differences in the workplace and the costs of autistic females’ ability to 'camouflage' their condition. This book is a must-read for parents, employers and adults with autism, and for anyone interested in the present and future of people with autism in the workplace who will benefit from the positive message that employing autistic people is not an act of charity but one that makes sound economic sense. Part 2: Which Job – and Why? Adam Feinstein is an autism historian and researcher, and author of A History of Autism: Conversations with the Pioneers (Wiley-Blackwell 2010).